Montebello Mom: IKEA Covina: Free family fun for all! If you and the kids are at home with no plans for the day and everyone is itching to do something, anything, a trip to IKEA is the answer! It is by far the most mom friendly place I have ever been. I started frequenting IKEA when I was home on maternity leave. As any mom will tell you, a day filled with taking care of toddlers, changing diapers, and nursing occasionally gets dull and sometimes you need to go out to a place where you can take care of the babies and amuse yourself at the same time. IKEA fit the bill perfectly. IKEA is an easy 20 minute drive from Montebello. It's big blue and yellow building can easily be spotted off the 10 Freeway at Barranca Avenue in Covina. The huge Disney-esque parking structure has extra large spots reserved for families with young kids near the entrance on first floor. The second floor of the structure is open to the air and provides a beautiful view of the Covina hills and the open sky. One inside I make a beeline for the Smaland play area. 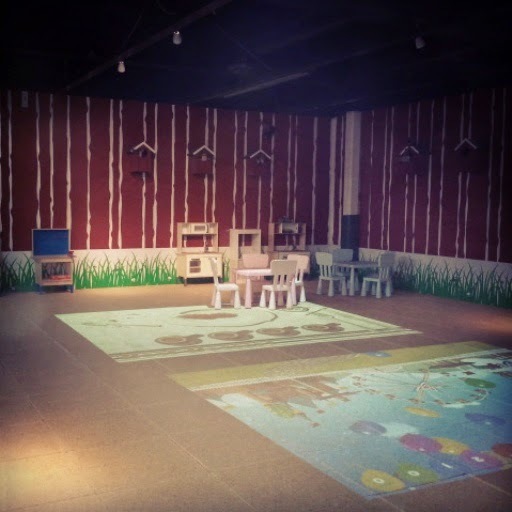 Smaland is a supervised play area where kids from 37-54 inches tall can play for up to an hour while parents shop. If you join the IKEA Family program kids can play for an extra 30 minutes on most weekdays. The newly remodeled play area has kid sized bathrooms, interactive video game floors, an auditorium style TV viewing area, and lots to engage a child's imagination. If by chance you get to Smaland and it's at full capacity check in with the attendant and sit in the waiting area. There are benches for waiting and there is usually a Disney movie showing. You can spend some time looking through the windows into the play area and point out to your child all the fun things to do and ask what they are going to try first. Once you get called, you sign your kids in, the kids put their shoes in a bin, everyone gets stamped with a number, the kids get stickers for their backs, the parents get a pager and you're free to do as you please, except you can't leave the building. But not to worry, IKEA has a lot to offer. If you have a child over 54 inches the Smaland sign says they have hand held games to lend. Children under 37 inches can enjoy a play area just for them upstairs in children's furniture. Upstairs IKEA has all the larger furniture pieces set up in the showroom for kids to try. There is usually a tent, tunnel, tables, chairs, benches, stools, and rockers all for playing! There are also sample kids bedrooms and playrooms set up throughout the area. Children and parents are encouraged to try out the displays at IKEA so kids are allowed to climb on the beds, open the drawers, and pretend! This is a display of a kid sized kitchen the IKEA has for sale, complete with kitchen pots, pans, and other elements. One mom had to drag her daughter away from this set. There are also real kid sized bowls, plates, cups, and utensils for kids. IKEA is one of the few places where real metal kid sized utensils are sold. The Disney Store also sells metal utensils, but we all need a break from the Princesses every now and then. This next area is great for nursing moms or parents with young kids. It's a family bathroom located upstairs just a few steps away from the children's furniture area. The door locks and there are couches just outside. The bathroom is big enough to roll a stroller in and is complete with comfy chair, table, toys, step stools, and an emergency help button near the toilet, "just in case". A cabinet in the family restroom is stocked with diapers near the changing table in the event that you find the diaper bag empty. IKEA Covina is complete with a cafeteria style restaurant. It's conveniently located near the bathrooms, elevator, and children's furniture section. It's similar to a school cafeteria, you grab a tray and make your way through the line adding what you want to the tray and placing your order with the servers. Tuesdays at IKEA kids eat for free. No adult purchase is necessary, the kids simply need to be present at the restaurant cashier and there will be no charge for the kid meals. There are four kid-friendly meals on the menu which includes chicken nuggets/fries, pasta, and two kinds of meatballs/mashed potatoes, all come with a choice of a jug of milk, jug of chocolate milk, juice box, or soda. The last time I checked they also sold jars of baby food. There is a family needs section in the dining area that has a bottle warmer, microwave, and kid utensils. If you have your hands full with a stroller or have children with you, utilize this handy tray cart. Three trays can fit on the cart at once. If you can't find a cart near the line entrance check the dining area, you can usually find a few there. The dining area is very large, bright, and open. One wall is comprised of windows and this is the view. Beautiful at any time of day. Feel free to bring your laptop or iPad, IKEA has WiFi in the restaurant! Before you leave be sure to take a look at the AS-IS section of the store. There IKEA has all the returned or slightly damaged display merchandise for sale. I once found a large plush carpet for the kid's room for $75, marked down from $200. It just needed a good vacuum and when the carpet cleaners came to the house I had them spiff it up. It looked brand new. After you've picked up the kids from Smaland be sure to take them over to the Bistro near the check out registers. At the IKEA Bistro you can pizza, soda, cinnamon rolls, hot dogs, packaged Swedish food, and frozen fat free yogurt! I tell the kids it's ice cream, all they care about is that it's white and it's on a cone. The ice cream costs exactly $1 so I use the Bistro as the kid's first try at placing an order and paying a cashier. I hand them each a dollar, stand to the side, and have them wait their turn in line. They love the independence and I don't have to worry about them handling coins from change.